Seven people have been killed and at least 48 injured in a terror incident in London in which three male attackers were shot dead by police. 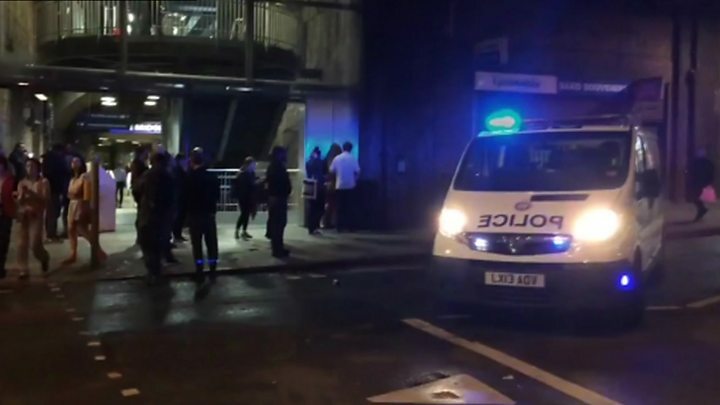 A white van hit pedestrians on London Bridge at about 22:00 BST on Saturday, then three men got out and stabbed people in nearby Borough Market. Political parties have suspended national general election campaigning and the prime minister is chairing a meeting of the government's Cobra emergency committee. 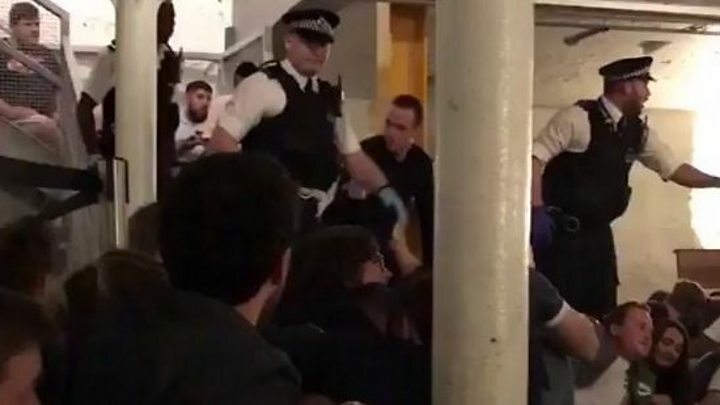 Theresa May described Saturday night's events as "dreadful", while Labour leader Jeremy Corbyn called them "brutal and shocking". Borough Market is an area known for its bars and restaurants which were busy on a warm summer evening. London Mayor Sadiq Khan said it was "a deliberate and cowardly attack on innocent Londoners", but the capital remained the "safest global city" and Londoners would not be cowed by terrorism. Media captionEyewitness: "They were running and stabbing everyone"
It is the third terror attack in the UK in three months following the car and knife attack in Westminster in March, which left five people dead, and the Manchester bombing less than two weeks ago, in which 22 people were killed. Metropolitan Police Assistant Commissioner Mark Rowley said it was believed there were only three attackers involved and the explosive vests they were wearing were "hoaxes". 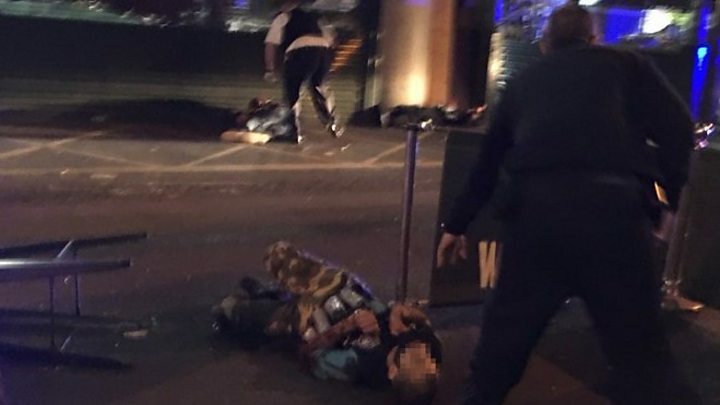 One social media user posted a photograph appearing to show an attacker lying on the ground outside a pub in the food market, with the fake vest visible. BBC reporter Holly Jones, who was on the bridge at the time of the attack, said the van was "probably travelling at about 50 miles an hour". "He swerved right round me and then hit about five or six people. He hit about two people in front of me and then three behind," Ms Jones told the BBC News channel. Another eyewitness, Robbie, was sitting in a taxi opposite the Barrowboy and Banker pub on London Bridge. "I saw about 20 or 30 people rushing to get back into the pub and five seconds later a big white van came screeching down the pavement," he told BBC Radio 5 live. "Two or three people jumped out. Initially, I thought it was a road traffic incident and the people had jumped out to see if anyone was injured, but I could tell immediately, they looked very aggressive." His friend Josh came out of the pub a few seconds later and saw people running up to the bridge from Borough Market. "A chap ran up and I heard him shout, 'He's got a knife, he's stabbing people.'" Another witness, Gerard, told the BBC: "They were running up shouting, 'This is for Allah.' They stabbed this girl maybe 10 times, 15 times. She was going, 'Help me, help me.'" Gerard said he chased the attackers, who were running into pubs and bars, and threw bottles, chairs and other items to try to stop them. "I stood up to take a look and then all of a sudden there were gunshots. Lots of people were screaming." Steven was taken into the basement of the bar before the police came in and told everyone inside to run. No-one has been able to clean up the empty pint glasses on the tables outside Belushi's bar on Borough High Street - a stark reminder of what happened in London Bridge last night. It's 8am and dozens of police cars and cordons remain in the area, blocking anyone from walking up to Borough Market, where the tragedy unfolded. Dozens of people wait by the police cut-off areas in a confused state trying to work out how to get home or to work. But no-one is prepared to give up. There is a determined resilience in the air with nurses and railway workers walking miles out of their way to try to get to their jobs. Security officer Mohammed Osman, who works on Borough High Street, had to wait for an hour before he was allowed through to his place of work. He said: "I'm not feeling worried. I'm strong enough. These enemies are trying to divide us but we have to be together." With three attacks in close proximity, terrorism against soft targets is beginning to feel, to some people, like the new normal. Plans to use bombs, such as at Manchester Arena, are rarer because plotters need to have the technical skills for such an appalling attack - but attacking people with cars and knives is far easier and has long been encouraged by so-called Islamic State and other jihadists. The aim of the three attackers last night is abundantly clear - not only did they want to kill, but they almost wanted to lose their own lives. They would've known full well that attacking people in the street would draw armed police in their direction and the fake bomb belts they were wearing would, in their own warped minds, hasten their demise. A bomb disposal team was later called to Borough Market and local residents told to leave their homes. 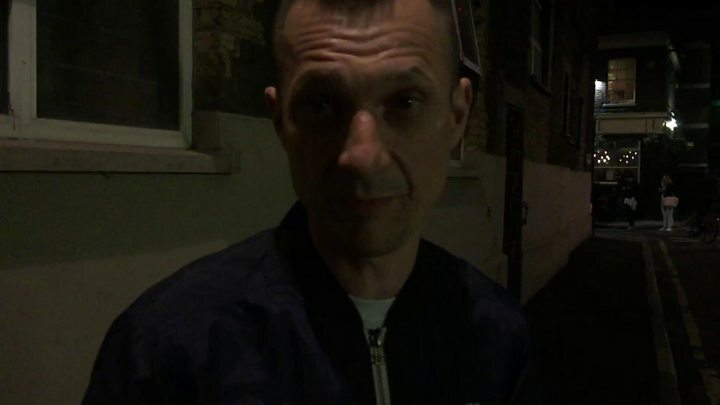 Eyewitness Will Orton, who was also in a pub close to the scene, said: "The bouncers did a really good job, they shut the doors and locked everyone in. "There was panic - it seemed like it was literally outside the door." Vilwar Hussein helped carry the injured police officer to nearby Guy's hospital and recalled seeing a wound in his chest "and blood everywhere". Earlier, Vilwar said he'd seen the white van perform a U-turn on London Bridge before driving back southwards along the pavement. London Bridge and neighbouring Southwark Bridge are both closed along with many other roads including Borough High Street and Lower Thames Street. Trains are not stopping at London Bridge station. Facebook has activated its safety check so people in London could post a message to let friends and relatives know they were safe. The police are asking anyone with photographs or videos of the incident to upload them here.